Everything you do starts with a single thought. When you aren't happy in your life, it's because your thoughts aren't the right thoughts. Thought-Talk by Kay Drummond is a book that has been written from the heart and from life experience. Suffering with low confidence and low self esteem from childhood and throughout a greater part of her adult life gave Kay the desire to help those of you who are going through daily challenges as she did. Kay has realised that her problems began when she was a child. She was told "Go away, we don't want to play with you" . That's all, not much was it? To a sensitive, shy child, however, it was more than enough to affect her for life. She took those words to heart and no matter that they weren't particularly said to hurt, and no doubt forgotten a few hours later by the child who said them, they were never forgotten by her. That seemingly harmless sentence seared deep into her very being and nestled there growing as she grew. It held her back and stopped her from being a confident outgoing child. Instead she withdrew inside and remained this way for most of her life. Determined to change how she was, she worked on her self development reading many books and watching all sorts of videos on personal development. As a result she started this website in 2006 to help others. 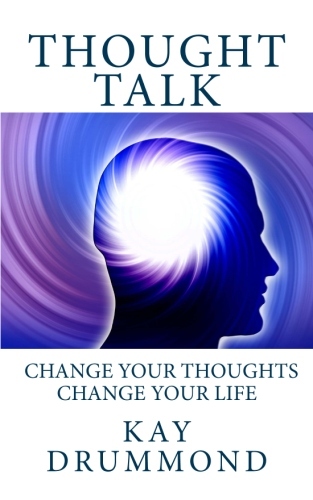 Thought Talk is filled with advice on how to improve the inner you. Kay believes this is where all problems start, with the thoughts you have. She understands how it feels to stand on the outside of a room willing yourself to enter, thinking that no one wants you to be there, and, finally, pushing down the fear, only to sit there and say nothing because you feel everyone is so much better than you. Thought Talk can help to change how you are. Each page offers guidance. Kay hasn't 'sugar coated' what she tells you. She knows it isn't going to be easy, but her advice is from the heart, with the knowledge that you can overcome your fears and change your life if you allow it. Click the link to purchase your copy. Remember, Thought Talk is about you, your hopes, and your dreams. It's about empowering yourself. It can change how you are if you allow it.